Russian President Dmitry Medvedev has called on Syrian leader Bashar al-Assad to launch promised reforms or step down as the country's leader. But he said this decision should be taken by the Syrian people and the Syrian leadership, and not by Nato or "certain European countries". 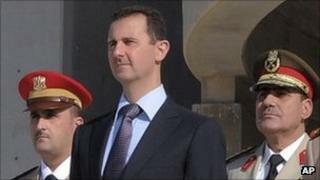 President Assad has used the army to try to quell months of anti-government protests but has also pledged reforms. Activists said seven people were killed in protests after Friday prayers. The UN estimates 2,900 people died since the protests began in March. Mr Assad has blamed the violence on armed gangs. "Russia wants as much as the other countries for Syria to end the bloodshed and demands that the Syrian leadership conduct the necessary reforms," Mr Medvedev said on Russian television. "If the Syrian leadership is incapable of conducting such reforms, it will have to go, but this decision should be taken not in Nato or certain European countries, it should be taken by the Syrian people and the Syrian leadership." Mr Medvedev has previously called for Syria to launch reforms but has stopped short of saying Mr Assad should step down if he does not implement them. The Syrian government has said it is in the process of introducing reforms and is speaking to opposition members. Mr Assad has announced local elections for December and parliamentary elections for February. Analysts warn that the protesters, who began demanding reforms but are now calling for the overthrow of Mr Assad, are increasingly resorting to the use of force. There are reports of a number of army deserters joining the protesters. On Tuesday, Russia and China vetoed a UN Security Council resolution condemning Syria for the crackdown on protesters. The European-drafted proposal had already been watered down to try to avoid the vetoes, with a direct reference to sanctions against Damascus dropped. But Moscow and Beijing said the draft contained no provision against outside military intervention in Syria. They accuse Nato countries of abusing UN resolutions on Libya to launch air strikes in aid of rebel forces against Col Muammar Gaddafi's troops. Meanwhile, activists said seven people were killed after security forces opened fire to try to disperse protests after Friday prayers. The UK-based Syrian Observatory for Human Rights said four people were killed in the central city of Homs when security forces opened fire on crowds leaving mosques. And the group said snipers killed three people in the Damascus suburb of Douma, one of the few districts of Syria's capital to be touched by the anti-government protests. Speaking to the UN Human Rights Council, Syria's Deputy Foreign Minister Faisal Mekdad said his country was "grappling with terrorist threats". He said he would provide the 47-state Council a list "more than 1,100 people who have been killed by the terrorists", including civil servants and police.